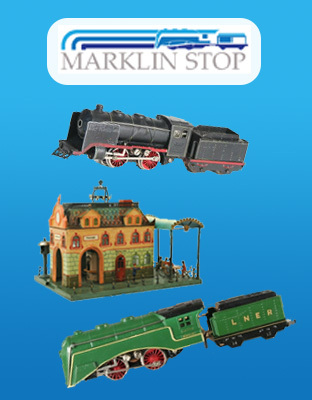 Richard Maerklin Toys, located in New York from the mid 1920s to the late 1930s, is the paragon of Marklin’s international trade prowess. 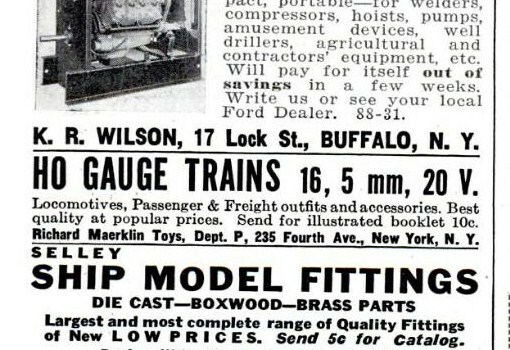 Despite its importance, there is little known information on the operation of the toy store in New York and its crucial role as an importer of Marklin for the US. I can safely say this because after several years of collecting, I have only seen one or two mentions of RMT (Richard Maerklin Toys) and their descriptions were rather ambiguous and unsubstantiated. This articles aims to clear up some of the confusion behind RMT. All of the research presented in this article comes from an archive of the operations of RMT recovered from a New York estate after 60 years of storage. These archives have vouchsafed an impeccable look into how Richard Maerklin ran his store and created a Maerklin legend. Before we go into a discussion on RMT and its success in the 1920s and 1930s, I would first like to briefly describe some background information on Mr. Richard Marklin. After searching through dozens of ship’s manifests from the late 1920s, I stumbled upon a record of the S.S. Berengaria which sailed from Southampton, UK to New York, USA on the first of October, 1927. “Richard Marklin” was a single, male engineer from Goppingen at 30 years of age. He was the only son of Eugen Marklin (1861-1947) and was therefore a direct descendant of the Marklin lineage. His Immigration Visa was issued in Stuttgart on September 7, 1927. This was Richard’s first trip to the USA and other ship records note that he went back to Germany and later returned, but this time sailing on the S.S. Cleveland from Hamburg on January 9, 1929 with a visa acquired again through Stuttgart on November 23, 1928. This confirms previous statements that he began selling in 1928 (although not for the full year because of his travels). Inside this mysterious brown folder resided for over 60 years several letters from Marklin (4/5/30 and 4/14/30), a six page Ausverkaufsliste from July 1930, and a smaller half-sheet letter from Marklin dated August 18, 1930. What was even more fascinating was that this brown folder was not actually a folder, but rather a special catalog with very crude printings of some 1930s models in production. Rather than being simply trains (although there are some trains pictured for the US market), there were pictures of clocks, a toy gun, cooking stoves, spinning tops, watering cans, carriages, steam engines, and even more. All of the model numbers and prices (in US dollars) are hand written in beautiful cursive. Surely these catalogs did not go out to all of Marklin’s dealers because they would have simply been type printed if that was the case. 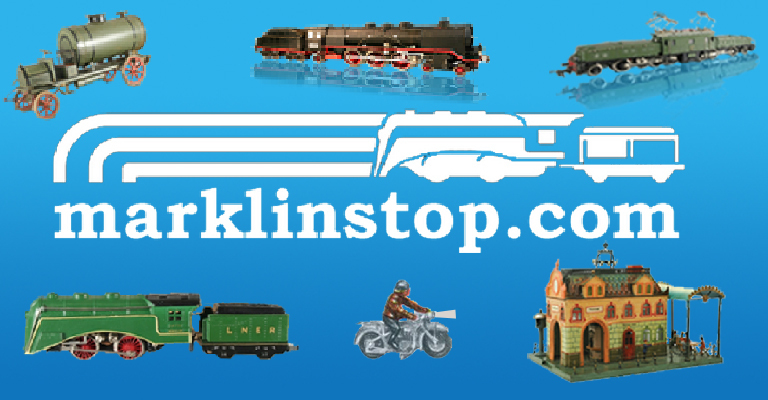 Unfortunately not everything is so easy to decipher and explain: I have no idea why the logo for Marklin is “Marklin Metallbaukasten” because that was just one of the toy lines Marklin produced in the 1930s. The writing in German states, “Wir bitten Sie davon Kenntnis zu nehmen, dass nachstehende Nummern ausverkauft wurden und daher nicht mehr geliefert werden können” which roughly translates (I am no German linguist!) “We are pleased to take note that the following numbers (article numbers) are sold out and therefore cannot be delivered.” The two letters below also alerted Richard Marklin of the items that were sold out for that year or perhaps these were monthly notices or even by season. 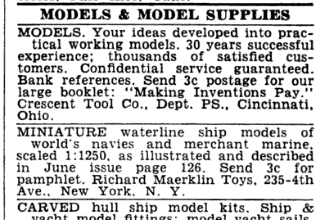 What continues to baffle me is the question, “Why would Marklin produce a ‘sold-out’ list and even a catalog?” It is almost like Marklin is sending this catalog as “Oh, here is everything that we have, and by the way, it is all sold-out.” In the past I have seen many of Marklin’s catalogs and other printed materials including “zusatz” catalogs, neuheiten catalogs, supplemental catalogs in the 1940s and 1950s, and even dealer pricelists and order forms, but never have I seen a “sold-out list.” Seems strange to me especially since a simple list would be sufficient in alerting Richard of what items were not available. The list below (which is a sort of hybrid pricelist) adds to the confusion. 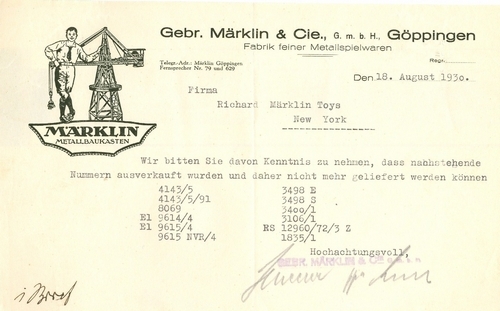 It states that it is a “Sold-Out List for Spring of 1930.” This list states the model number, new price (for US dollars – which Richard sold), old price (items for sale in Germany) and even “Vorrat” which means “Quantity.” I am unsure of what this actually means; however, because how can there be a quantity for something that is sold out?!? The numbers have been blurred for privacy as I know Marklin wished to never release their production run numbers and I have no idea if these numbers could possibly give away some of this information. To finish our story (more of a puzzle) of Richard Marklin, I would like to applaud Mr. Marklin for his brilliant marketing abilities. It seems that he was able to get two ads (as far as I know) in both Popular Science and Popular Mechanics, but unfortunately to his chagrin, these were at the end of his career in 1936 and 1939. It is uncertain what his role was in the Marklin business after the Second World War, but a picture of him can be seen in 1959 at the Marklin 100 year anniversary. It is also uncertain when he died as I could not find any records on his death. I hope you have thoroughly enjoyed this article and I kindly ask anyone who knows an explanation for this ausverkaufsliste to please contact me and I will add an update to this article. 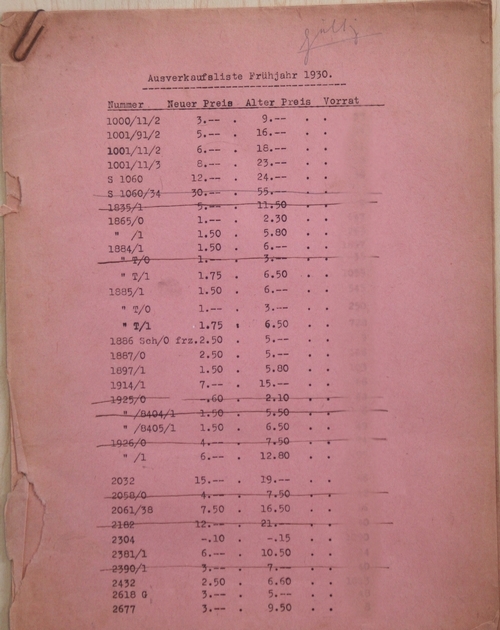 Thanks to several German readers, we have been able to determine that these “ausverkaufte” lists were not actually an inventory of sold-out items, but rather items that are no longer in production and therefore are sold at a discounted price. This fills in some of the gaps and explains why these letters and documents are carefully dated and updated regularly. As items went out of production or were no longer available, new lists were received and certain items were put on sale in order to make room for new, incoming stock. Perhaps the catalog with the illustrations represents the “ausverkauft” items of the entire year 1930 since there is no month on it. Thanks again to the wonderful readers who were able to clear this up! I have left my original assumptions in the article, but now realize the limitations of my ability to speak German. Thanks again to those who helped. This is what I’ve sold and I’m out of these and those items and I need some more of these and those. Märklin in Göppingen replied and said: We cannot sent you item(s) out of your f stock items list (Ausverkaufsliste), because we are out of these items aswell. As you said , it does’nt make sense to send you a list of items you have’nt got because they’ve sold out. the puzzle is, you are reading letters from Märklin in Göppingen and not including letters or lists Richard has sent from New York. Look at my theory and see what you think. in my opinion, there was a “Ausverkaufsliste” with items which were in stock but would not be produced again. Later on, there was a list with the parts listed in the list but sold out in the meanwhile, so no sense to order these parts again. The reason for the letter with the Metallbaukasten-Logo might be a result that the ordered parts have been parts of the Metallbaukasten system, but I don’t know that. Thanks for sharing this in “Alte Modelleisenbahnen”. Great article. The last part where you talked about the Sold Out List is actually a list showing what is being put on sale. Neuer Preis = New Price, Alter Preis = Old Price. Vorat = QTY available. This is a list they generated to show what they had in stock that they wanted to put on sale. The word “Ausverkauf” is used in Germany to describe sales. If you need any help translating please just email me. I can always help as I speak Fluent German / Translate. Again, great article and learned a lot. I think I can clear up your confusion, having lived in Stuttgart for many years and having dealt with the Maerklin factory and dealers directly for years. “Ausverkauf” means in German loosely to “Sell off” and refers to a sale of items that will no longer be produced. When the item is “Ausverkauft” it is sold out and is no longer available. Maerklin let their dealers know that those numbers were being sold off in “Ausverkauf” and when the available numbers were sold they were “Ausverfkauft” and Maerklin informed their dealers those numbers were no longer available. Ausverkauf does not mean it’s no longer available. It’s a SALE on remaining items. So it makes perfect sense that they are notified of remaining stocks, and then updated weekly on which items are now gone. Remember that the dates on the two notices are 5.4.30, or April 5th, 1930, and 14.4.30, April 14th. So maybe every two weeks or so… I would think that Richard was still using german date method at that time. Exellent article. Very interesting and professionell research! what happend to richard maerklin after 1939. did he stay in the US? Even as a person who doesn’t collect trains, this article is fascinating to read, provides interesting history, and an insightful argument. Being also a Meccano collector, maybe I can shed some light on why the logo was “Metallbaukasten”. The 1930’s was the golden age for Meccano and Hornby, which at the time was the largest and most profitable toy manufaturer in the world. Meccano was in those days the equivalent of today’s video games: every kid *had* to have at least one outfit! Märklin Metallbaukasten originated in a Meccano factory, that Hornby had build in Germany in 1914 but was confiscated by the German government at the outbreak of WW I, and subsequently transferred under Märklin ownership. Perhaps Marklin simply was keen to highlight that they were too a major supplier of the construction toys market, their offering being completely compatible with Meccano, but often with better materials, higher precision and some innovations, not present in the Meccano range. This is pure speculation on my part, but I hope it helps. A very interesting article. I truly believe that Maerklin would have grown to be as popular as Lionel in the USA had Germany not started two world wars which left behind so much anti-German feelings.